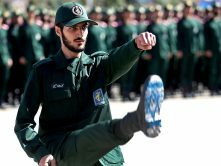 The Committee for Accuracy in Middle East Reporting in America, or CAMERA, was founded in Washington, DC in 1982 by Winifred Meiselman, a teacher and social worker. 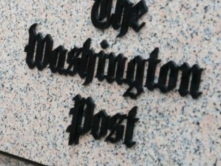 Mrs. Meiselman formed CAMERA to respond to the Washington Post’s coverage of Israel’s Lebanon incursion, and to the paper’s general anti-Israel bias. Joining CAMERA’s Executive Board in the early days were such prominent Washington-area residents as Saul Stern and Bernard White. 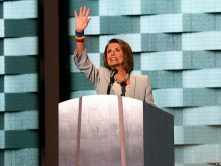 Win also recruited an Advisory Board which included Senators Rudy Boschwitz and Charles Grassley, Congressman Tom Lantos, journalist M. Stanton Evans, Ambassador Charles Lichenstein, Pastor Roy Stewart, and Rabbi David Yellin. Under Win’s leadership CAMERA created chapters in major cities, including New York, Chicago, Fort Lauderdale, Los Angeles, Miami, San Francisco, Philadelphia, and in 1988 a Boston chapter and office, founded and led by Andrea Levin. Ms. Levin had taught English in inner-city Philadelphia, and later served as associate editor of the Journal of Policy Analysis and Management at Harvard’s Kennedy School of Government. CAMERA opens Boston chapter (click for full size). 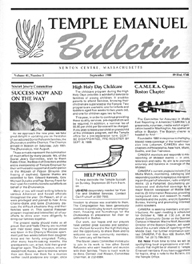 In 1989, CAMERA took a large step forward with a highly successful conference organized by the Boston chapter: “The Media, The Message and The Middle East.” The event galvanized public interest concerning the media’s power to sway public opinion on Middle East policy – and the potential harm of distorted coverage. Held at Boston’s Park Plaza Hotel, the conference drew an overflow crowd of more than 1000 attendees, and featured such well-known speakers as Norman Podhoretz, editor of Commentary Magazine, Professors Alan Dershowitz of Harvard University, Ruth Wisse of McGill University, Jerrold Auerbach of Wellesley, and David Wyman of UMass Amherst. Joining these speakers were Ms. Levin, who documented the Boston Globe’s bias against Israel, and the Boston chapter’s Deputy Director, Charles Jacobs, who critiqued a biased teacher’s guide which accompanied a PBS documentary. 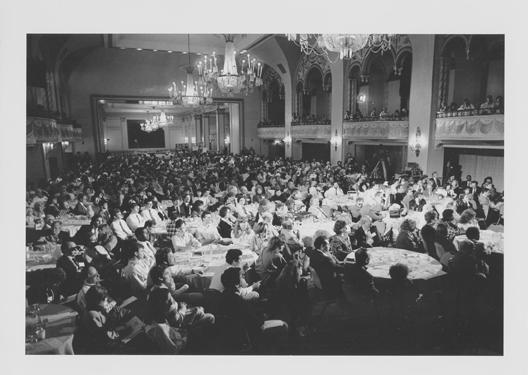 CAMERA’s 1989 Conference fills the Park Plaza Ballroom. After the conference the Boston chapter continued to grow rapidly, as the Executive Board was joined by noted professionals in law and medicine, as well as a number of Boston’s top business leaders, including the co-founders of such major firms as Timberland and Staples. CAMERA has long been active on college campuses. 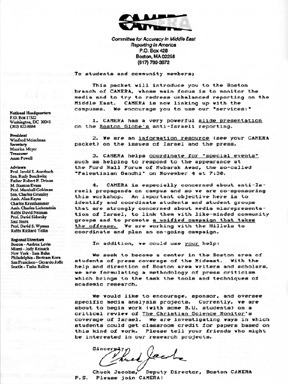 Here a circa 1990 letter to students signed by Charles Jacobs, the Boston Chapter’s Deputy Director (click for full size). 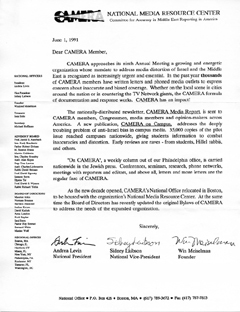 A 1991 letter to CAMERA members signed by Ms. Levin and by Win Meiselman, CAMERA’s Founder (click for full size). Under Ms. Levin’s leadership CAMERA’s membership grew within a few years from 1000 to over 20,000, and now numbers over 65,000. 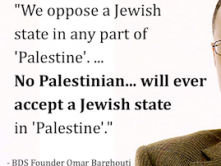 In addition to the Boston headquarters the organization also has offices in Washington, DC, New York, Chicago, Los Angeles and Israel. 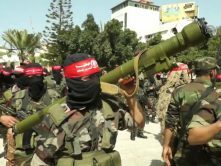 Over the years CAMERA has focused major efforts on improving coverage of Israel and the Middle East by such major outlets as the New York Times, the Boston Globe, the Los Angeles Times, NPR, PBS, and ABC News. While there have been major successes with most of these outlets, there is also a continuing need for monitoring and interaction. CAMERA continues to expand its programming and reach. Increased challenges have been met with increased innovation and effectiveness.